• White Ink Ready (WIR) provides ink circulation and pressurized pumps to reduce head clogging and maintenance downtime making sure your white ink is ready when you are. • One Pass (OP) is a patent-pending process allowing white base and colors to be printed in one pass. • InterWave Dot Technology (IWDT) developed for UV imaging significantly reduces banding in your prints. 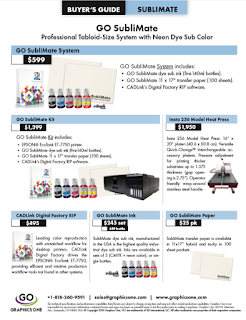 For added information on this outstanding new printer please go to: http://goo.gl/rGpPLK.